When you've had a hectic weekday or errands have consumed your time off, there are few things less enticing than standing over a hot stove managing multiple pots and pans. That's when you turn to these clever recipes for nutritious sheet pan dinners that satisfy your family without all the fuss and clean up of a more complicated recipe. Just arrange everything on a single, heavy-duty baking pan, pop it into the oven, and—voila!—a complete meal. 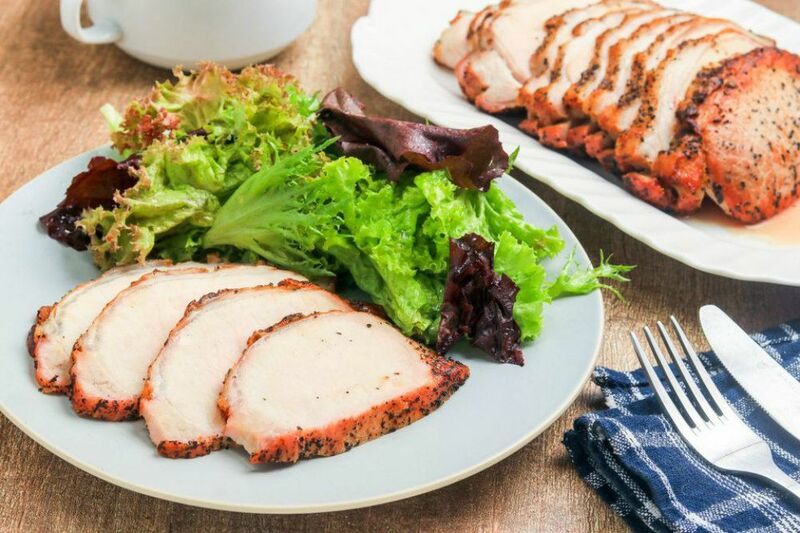 So whatever your family enjoys for supper—be it meat, fish, or veggies—these recipes will help take the stress out of getting food on the table. This easy, four-ingredient pork roast cooks on a rack set over a sheet pan. Slice it and serve for for Sunday dinner with mashed or baked potatoes, green beans, or your family's favorite vegetable side. This elegant sheet pan chicken cooks in under 30 minutes, making it a great recipe for last-minute guests. Chicken breasts are coated with mayo, seasoned, and baked until tender. Shredded mozzarella is added for a quick melt near the end of cooking and a slice of juicy tomato goes on top, along with balsamic reduction and basil. Who wants fish and chips tonight? These fillets with a panko crumb coating are crisp and tender and make a light and tasty alternative to fried fish. Serve with lemon wedges and tartar sauce, along with French fries and coleslaw. This pork chop dinner with potatoes and carrots makes a complete, budget-friendly family meal. The recipe includes a simple chicken broth sauce that tastes great drizzled over the chops. If you've never baked steaks in foil, this is the recipe to try! 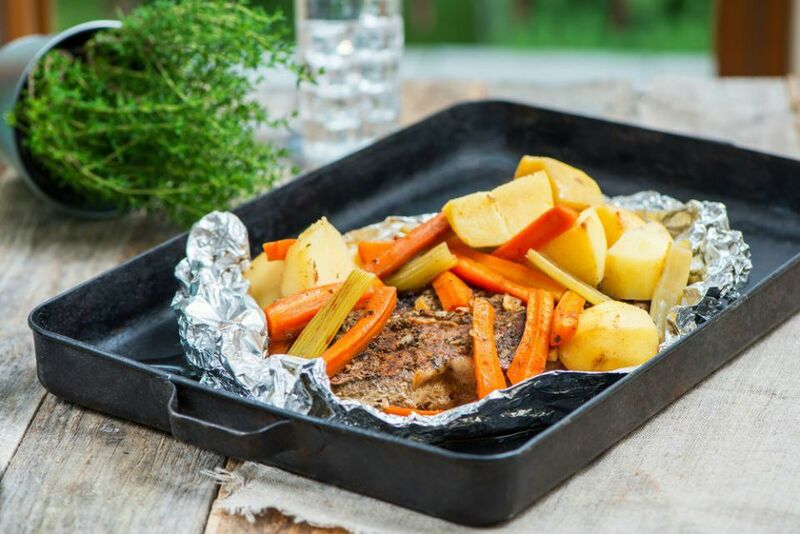 A single large, thick steak makes a hearty family meal, along with potatoes and carrots, using this oven sheet pan method. Onion soup mix is the secret ingredient—keep your pantry stocked with a packet just in case. Caramelized plantains and pineapple rings add island flavor to this family-friendly fish dinner. A savory glaze of maple syrup, balsamic vinegar, and soy sauce adds depth to flaky, meaty salmon. Sicilian-style pizza has a thick crust, classic tomato sauce, mozzarella topping, and a shape that's easy to cut for sharing. You make this one in the oven using a regular sheet pan—no pizza stone required! Add anchovies to be traditional, or top with pepperoni slices, chopped fresh vegetables, salty olives, or your other favorite 'za fixings. You won't have to fish for compliments when you serve this flavorful tilapia. It's seasoned with a roasted red pepper mayonnaise, plus herbs and spices, bringing out the best in mild-tasting fish. Savory spinach and cheese pie is a Serbian dish that makes a great vegetarian main course for dinner. Plenty of chopped greens go into the creamy, cheesy filling, which is then layered strudel-style on buttery phyllo dough and baked until the whole thing is golden brown and bubbling. Your family will love this oven-fried chicken, and you'll be a fan of the easy preparation and clean up. The juicy thighs are dipped in a honey-mustard mixture, then coated in panko crumbs and Parmesan, for a crispy, crunchy crust. Tender butternut squash, green brussels sprouts, and tangy cranberries are tossed with olive oil, salt, and pepper before going into the oven, in this easy, delicious roasted vegetable dish. Toasted pecans are sprinkled on top for extra crunch and nutty flavor. Fresh herbs and za'atar seasoning add lively flavor to tender chicken breasts in this one pan supper. Green beans and corn on the cob cook right along with the chicken, for caramelized veggies with loads of flavor and nutritious goodness. Catfish fillets are sealed in foil packets alongside diced veggies, margarine or butter, and a few seasonings. These are placed on a sheet pan and popped into the oven for tender baked fish. Serve with a green salad and crusty bread for dinner. Chicken, sweet potatoes, and broccoli are roasted in a simple soy-honey-lemon sauce in a one-pan dinner perfect for busy weeknights. Preheating the pan allows the chicken skin to crisp up and adding the broccoli halfway through means everything will be cooked just right. Pork tenderloin is surrounded by carrots, potatoes, and onions, and flavored with Italian seasonings in this complete meal. It's ready for your table in about an hour. Apricot preserves create a simply lovely marinade for boneless, skinless chicken breasts and potatoes in this incredibly easy dinner. Broccoli is added near the end of cooking to preserve its crisp texture.